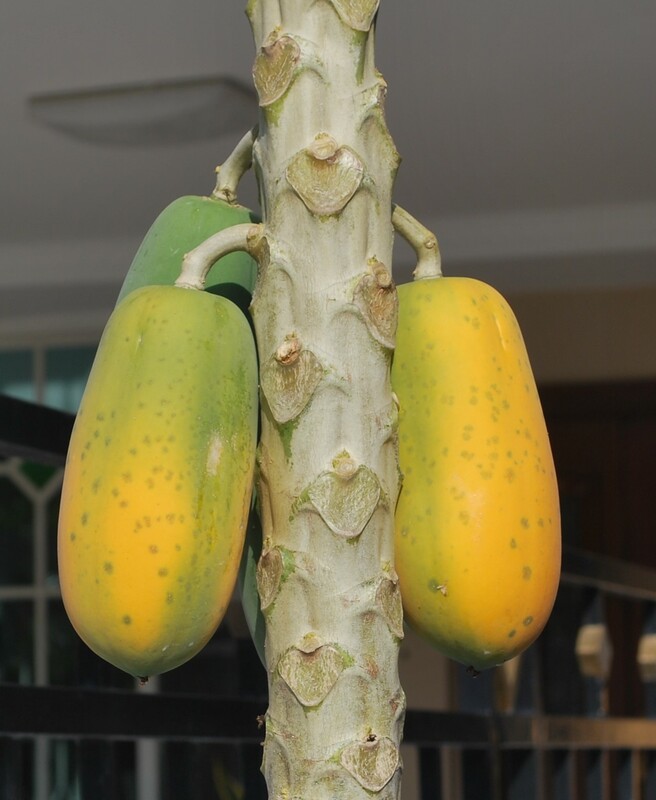 Somehow it found itself in the same pot as our papaya-mango? 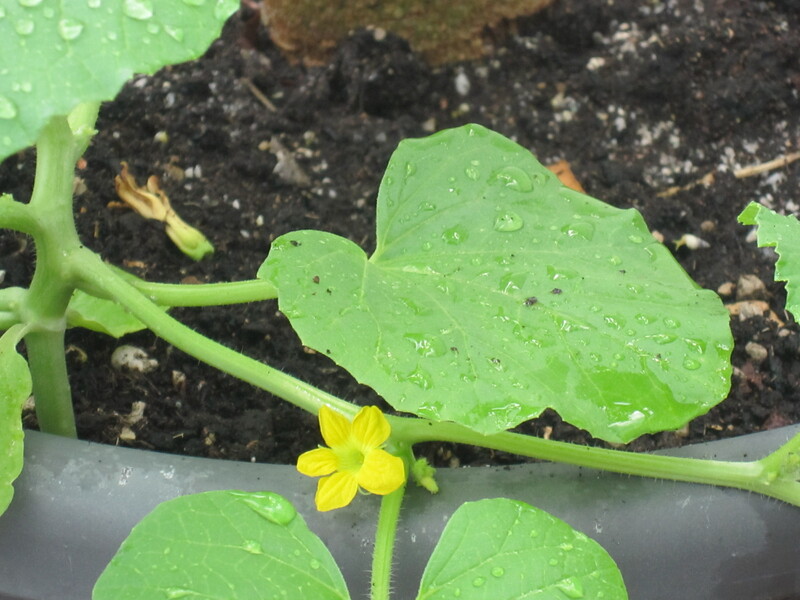 We thought it was a pumpkin but when the first flowers appeared, uh uh. Looks like a cucumber flower! Anyone want to hazard a guess? Have you played the game QuizUp? It’s a game you can play on your iPad or iPhone. You play against a random person and answer 7 questions on a topic of your choice. I like Medicine, Name the Candy and Name the Animal best. Mummy plays Literature (Classics and Children’s Literature), Classical Music and Food. She is also very good at Name the Candy but is a bit embarrassed to tell people that. Anyway QuizUp is the ONLY game Mummy has on her iPad. My Pediatrician says she does not know why Mummy cannot instal mindless games like she does. Mummy rolls her eyes when my Pediatrician says things like that. It is because Mummy is a Tiger Mum (Godma too) and my Pediatrician is a Meow Mum. In Literature, there is a very long book by Charles Dickens called A Tale of Two Cities. It is very boring. Even when Mummy tells me just the exciting bits, it is still boring. 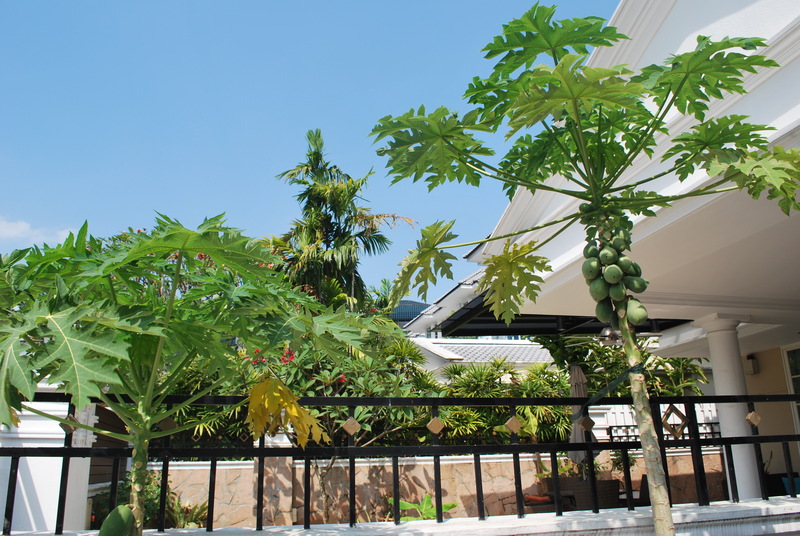 Today I have a tale of Two Papayas (actually papaya plants). It is not at all boring. 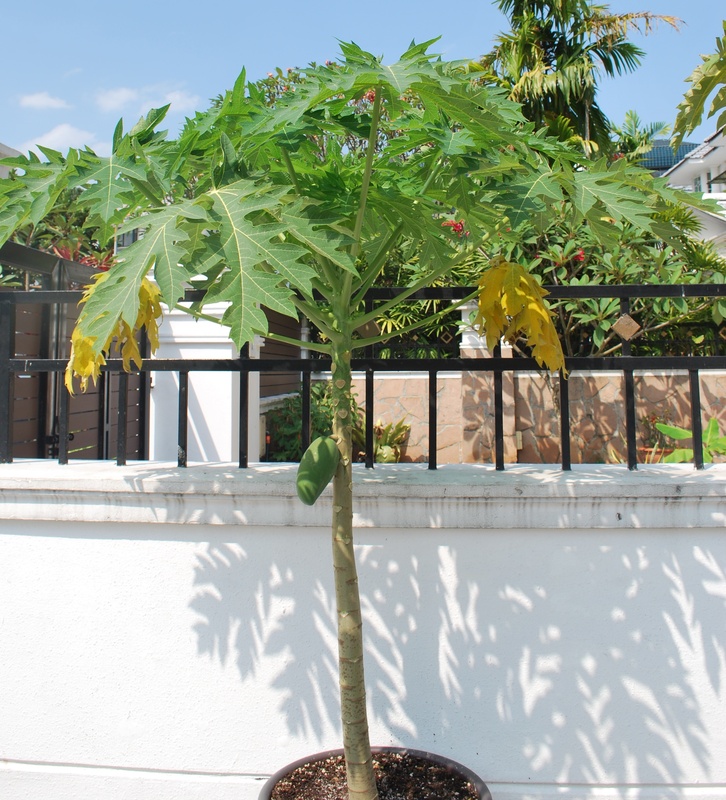 You already know about my first papaya plant, right? I’ve posted about it here, and here, and here, and here. When I came back from the holidays, I was very happy to see how it had been busy! 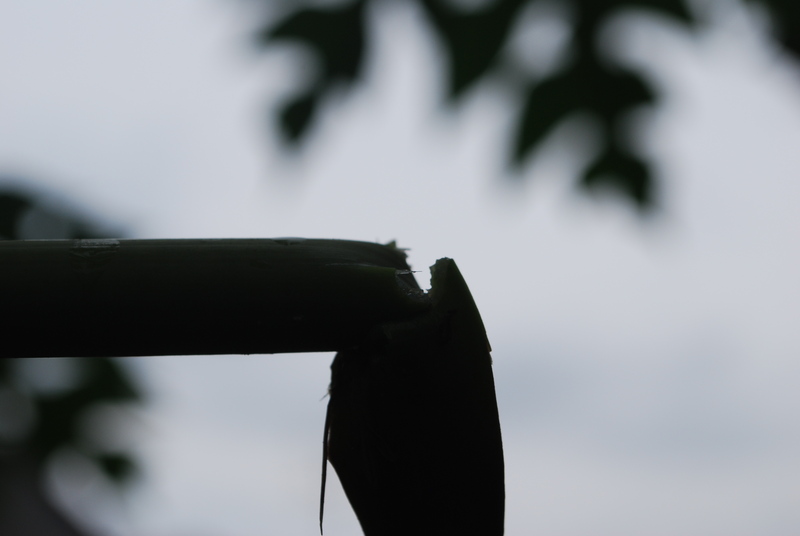 The photo below was taken from below, sometimes it’s useful to be short. 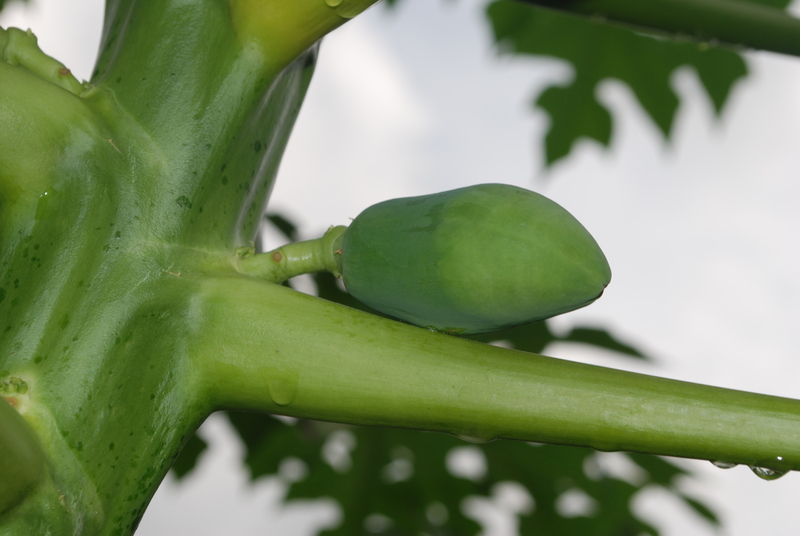 I know not all the papayas look perfect, but that’s just fine. 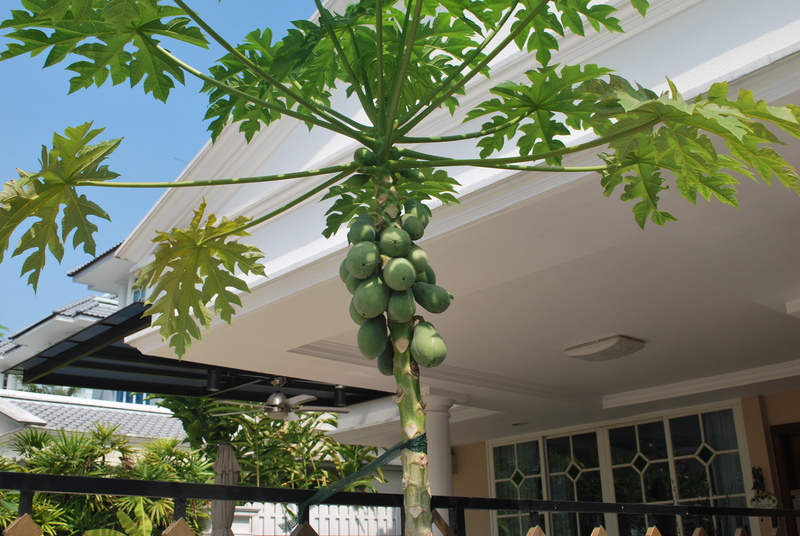 OK so that was one papaya. 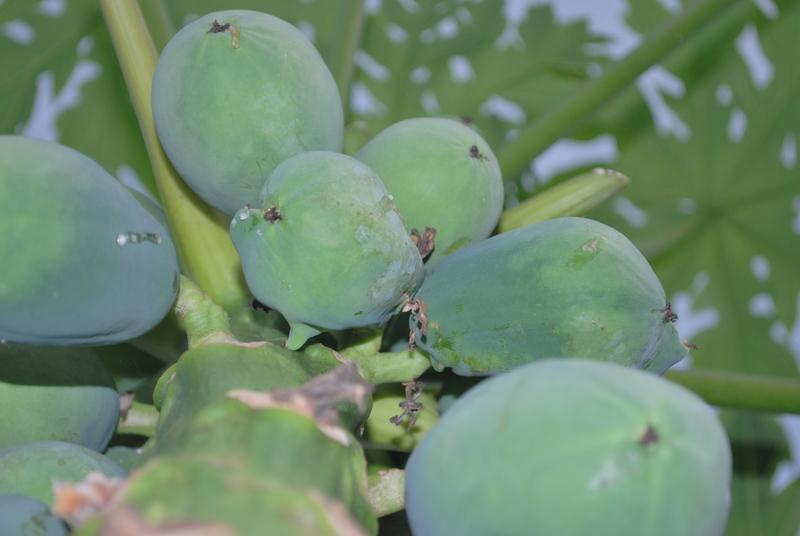 The second papaya is a different type – not a Hawaiian pawpaw like the first papaya. 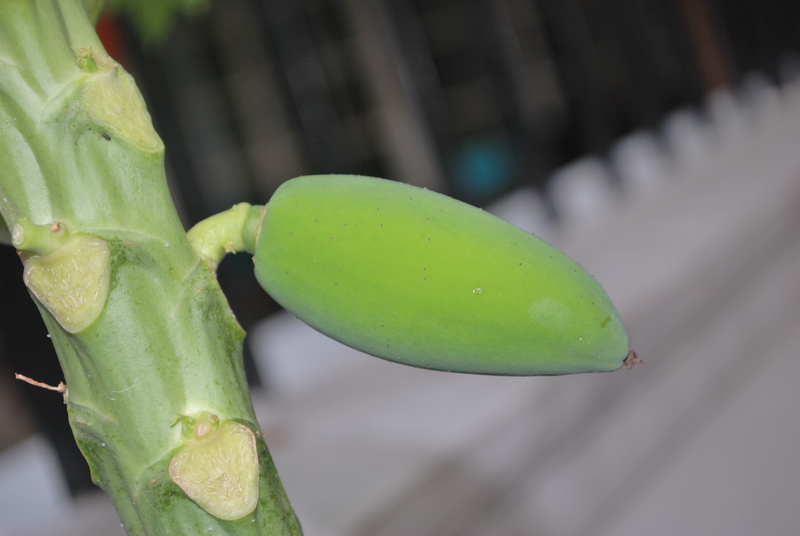 Even though the second plant is not even 3 feet tall, look what it has! 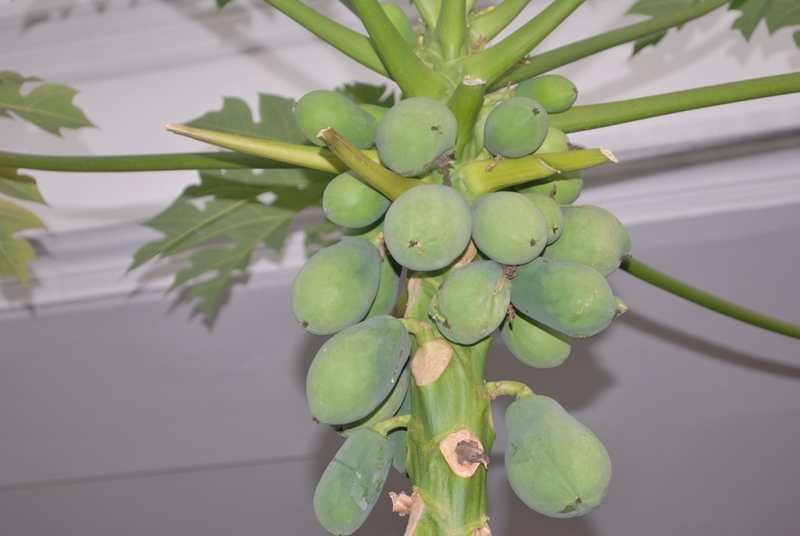 A Lone Ranger Papaya! Lately I have been singing along with Steve Green in the car. The Big Sister and Mummy unearthed some old CDs and screamed with excitement. They found 3 CDs by Steve Green and now we play them all the time. One of the songs is A Chosen Generation, and the bible verse tells us that God chose us and called us out of darkness into His marvellous Light. Light is very useful. I will show you why. Look at this. What is it? You can’t really tell because it is so dark. But when you have marvellous light (actually any old light will do), see? 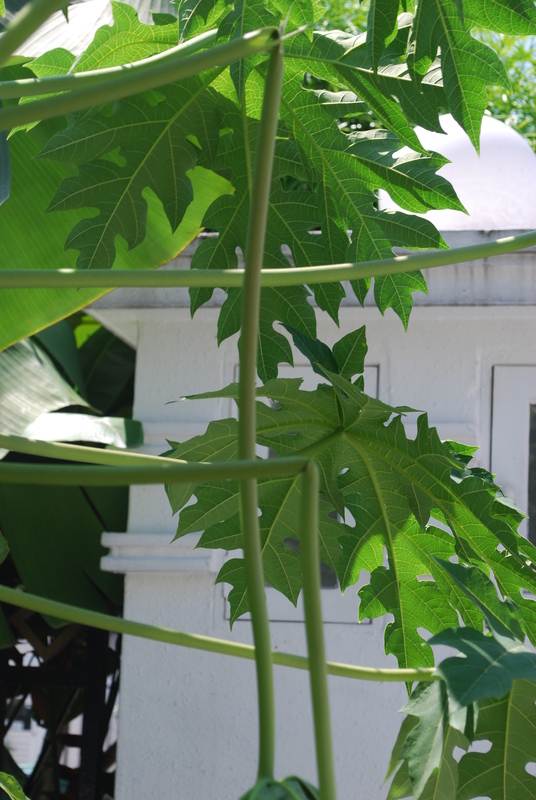 It’s just another of our papaya leaves that got bent when the tree fell over – again! We have now moved the tree next to the fence and TIED it there. We have had gale force winds and storms. Maybe I am exaggerating. My cousins in London really did last week though. Is this a bad sign?? A couple of nights ago there was a big storm! 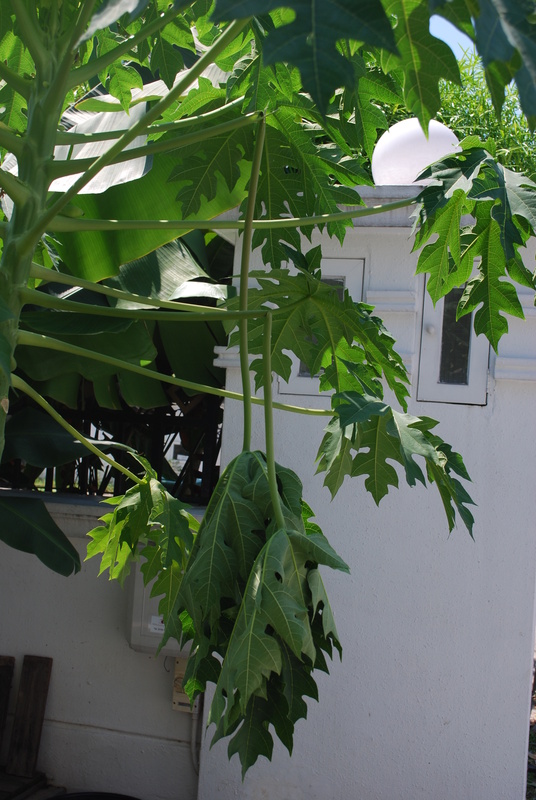 Our papaya tree (the one that was transplanted by Grandpa into the big Toyogo pot – see this and that) blew over. When Daddy woke up in the morning, he found it leaning on our big car. 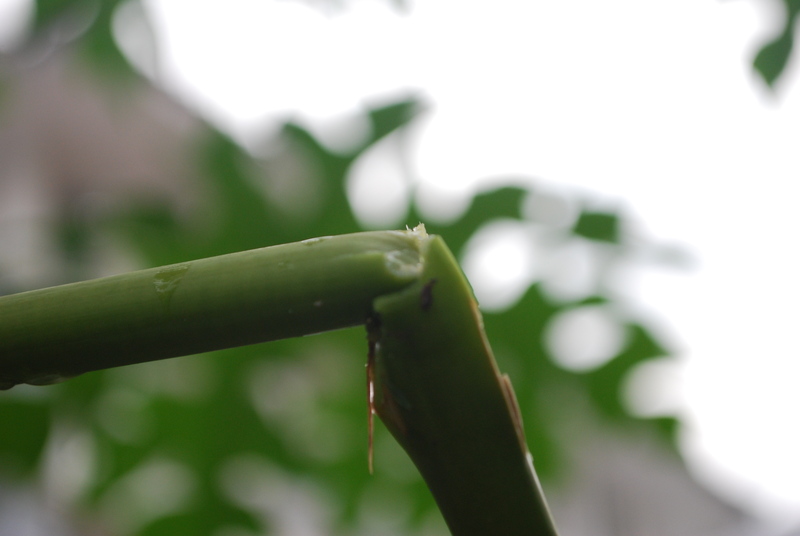 He righted the tree, and it seems quite well, except that… well, look for yourself! There are 2 right angles. We are learning geometry at school. That is very cruel to 9 year olds. Anyway, I asked The Big Sister, if 90 degrees is a right angle, what is a wrong angle?